Thanks to everyone who came out last Sunday to help us celebrate our second anniversary! It’s truly been a spectacular two years at 1781 Florida Ave. with amazing customers, fantastic vendors and a dedicated staff. We’re so excited to continue growing as a company and have a new management team in place to help us do so. You’ve probably seen us all behind the counter, sipped our lattes and devoured our sprout salads. Here’s your chance to learn more about who we are, where we’re from, and what we each contribute to the Pleasant Pops community. Growing up in Durham, North Carolina, Hannah brings her own twist of southern charm to the management team. 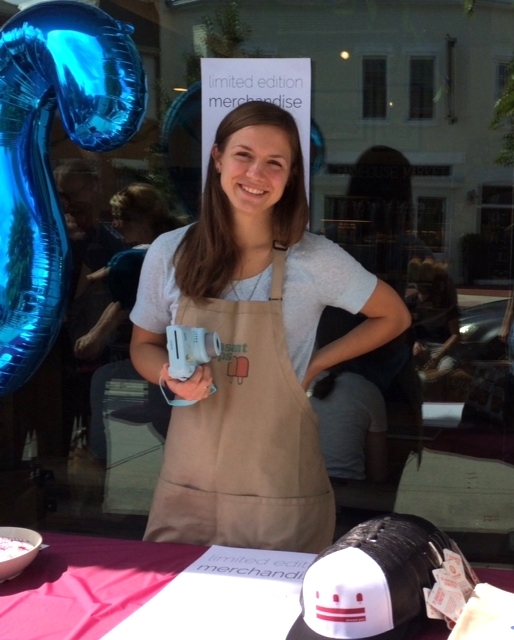 After moving to D.C. in 2012, Hannah was quickly hired by Pleasant Pops and began working before the store was fully constructed. With previous experience working for fine-dining restaurants, neighborhood cafes and bakeries at farmers’ markets, Hannah was a perfect fit for the Pleasant Pops vision. 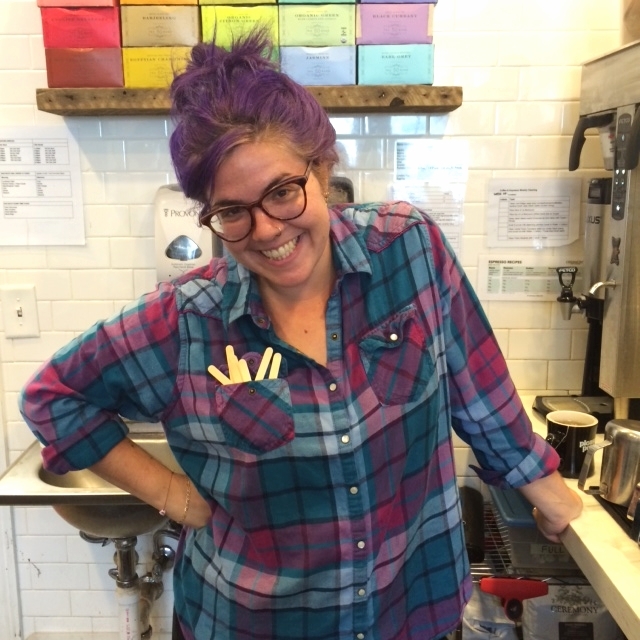 The work Hannah does in the cafe is endless: she hires and trains all employees, makes the weekly schedule, helps create recipes for all our lunch and dinner items, and she writes every price sign in the store (not to mention her flawless latte art). She is often seen with an Elon sweatshirt, long pony tail and big smile and isn’t afraid to put on “Today’s Country Hits” in the cafe. Though market season has come to an end, there’s no reason to fret because Ben isn’t going anywhere. 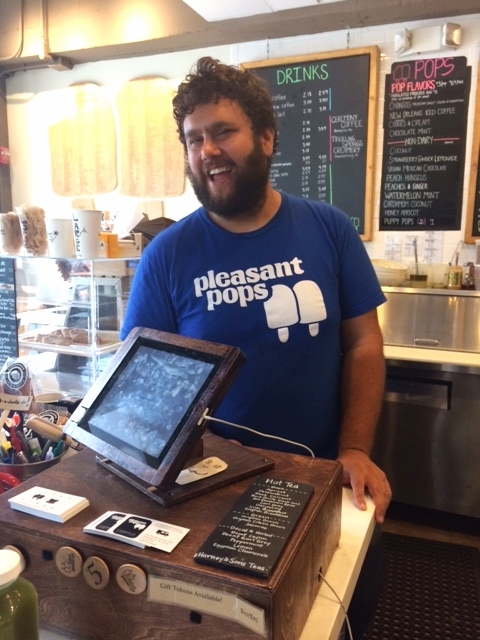 After joining the Pleasant Pops team in spring 2013, Ben quickly took over our farmers’ markets, bringing pops and smiles to both the White House Farmers’ Market (every Thursday) and the Mount Pleasant Farmers’ Market (every Saturday). Growing up in Chicago (“Go Bears”), Ben moved to D.C. in 2009, bringing much mid-western charm with him. Notorious for his colorful and quirky t-shirts, gregarious presence and cheerful salutations, I dare you to interact with Ben and not smile. For more about Ben’s work at farmers’ markets, check out our blog from a few months ago! Aaron hails from Pennsylvania, just around the corner from Hershey, and moved to D.C. in 2011. After spending years working for Ocean City Beach Patrol, Aaron moved inland and started working for Pleasant Pops in spring 2013. If you’ve ever met Aaron, you’ll know he’s a people person, or “chatty Cathy” as I like to say, which is a trait that lends itself perfectly to the Pleasant Pops vibe. 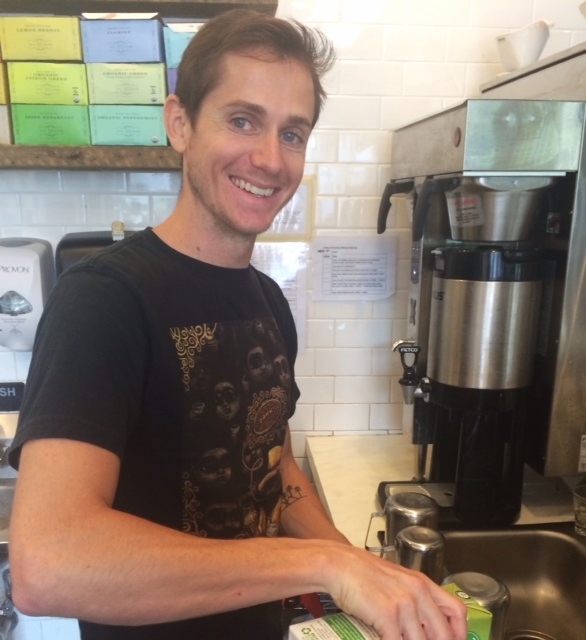 As the cafe manager, Aaron is in charge of tasks like ordering coffee cups, designing training manuals and enforcing the dress code (sounds fun, right?) He also, luckily, has the awesome task of finding new products for us to carry at Pleasant Pops, and has brought things like Jrink (cold-pressed juices), Ever Bars (hemp-based energy bars) and 2 Armadillos (crispy chickpea snacks) to our shelves. If you’re at the shop and chill-wave music is playing, just look for the agile guy behind the counter talking enthusiastically about weather patterns and you’ve found Aaron. As you might have learned from previous posts, I grew up in Western Massachusetts. After living in Nova Scotia for four years, and Boston for a few years after that, I moved to D.C. in 2012. Thankfully I was hired by Hannah (on behalf of Pleasant Pops) in early 2013 and quickly found my place on the team. After working in the cafe for many months, I slowly began taking on more behind the scenes tasks, my favorite being our Instagram feed. Being a fan of selfies, delicious food pics and cute puppies doing cute things, my enthusiasm for the social media of Pleasant Pops helped me land this new role. Now in charge of all press inquiries (check out my first accomplishment in the Washington Post Express article about pumpkin dishes) and all Non-Profit Partnerships/Donations, I’ve got my work cut out for me. Just keep in mind that every time a new person follows @pleasantpops on Instagram my heart flutters just a bit. If you need to spot me, I'm the one with the purple hair. Newer PostThey're Back! Hot Pops, Hooray!